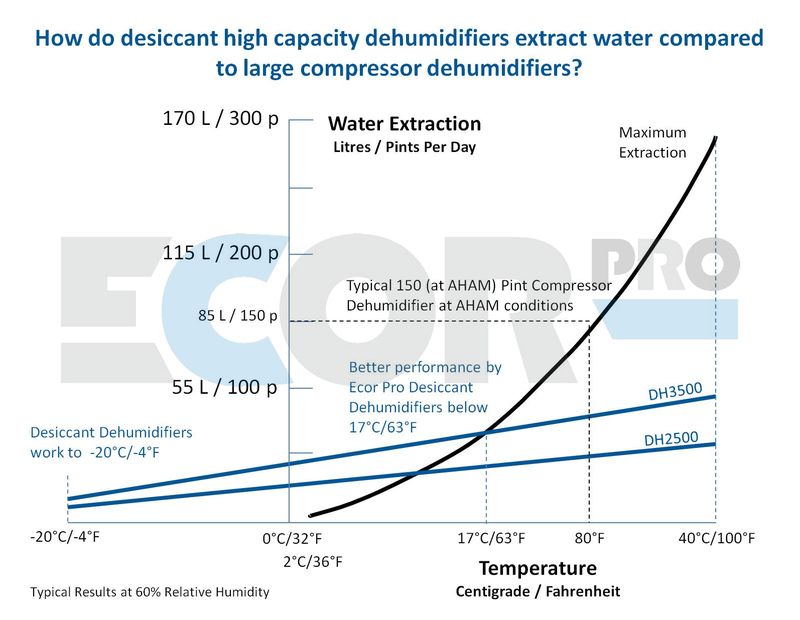 Desiccant dehumidifiers or "absorption" dehumidifiers are not just good at working in colder temperatures, industrial grade Ecor Pro desiccant dehumidifiers can even keep drying the air down to -20°C. Compressor dehumidifiers & home desiccant dehumidifiers usually stop working at 5°C to protect the appliance from frost damage. Compact size on four feet with all stainless steel construction. Used for building drying, protection of garages, warehouses, houses server rooms, industrial processes. Can be carried by one person and transported easily. - System can be pressure neutral. Ideal for closed environments where bringing outside air into the drying area is not desired. e.g. cold rooms, house lofts, crawl spaces, medical rooms, food storage, pharmaceuticals, walk in freezers. The 4 hole system has two fans internally. It can be used in the same way as a 3 hole Ecor Pro desiccant dehumidifier. However, it has the advantage of the two airflows can be made separate. 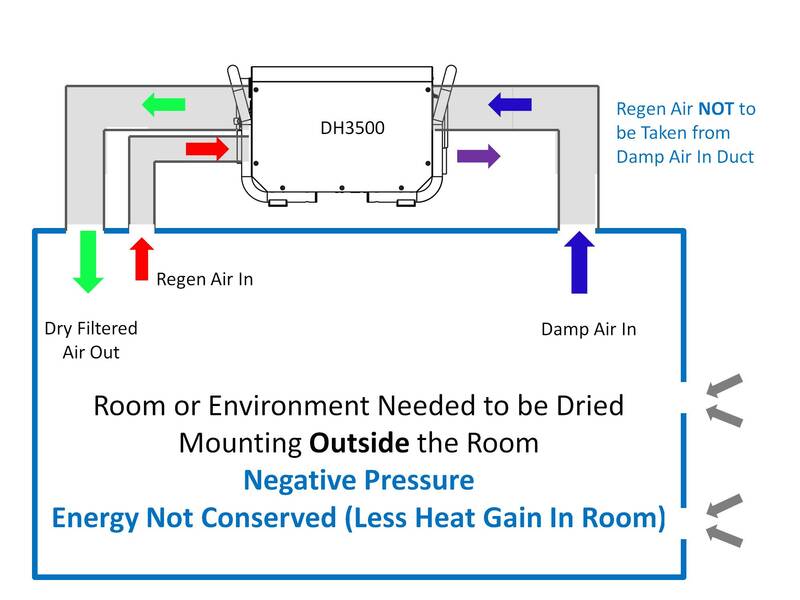 When the wet air is exhausted the "Regen" or regeneration air can also be taken from outside of the room. The 4 hole unit has the advantage it can operate in a "pressure neutral" way. The room can effectively be sealed as with a metal container. 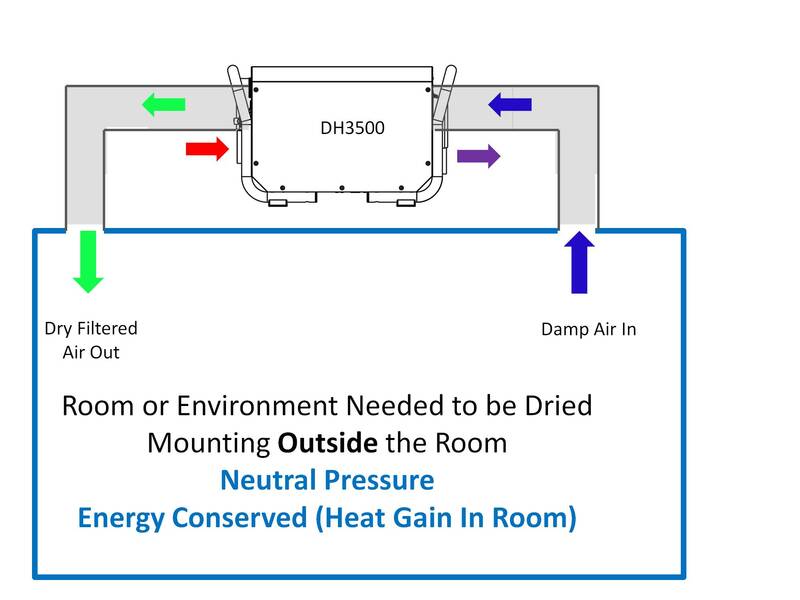 Air in the room can be continuously dried without any air from the room being vented away or ingression into the room due to a negative pressure. Not only is it a more efficient as a drying system but it also conserves the heating energy. 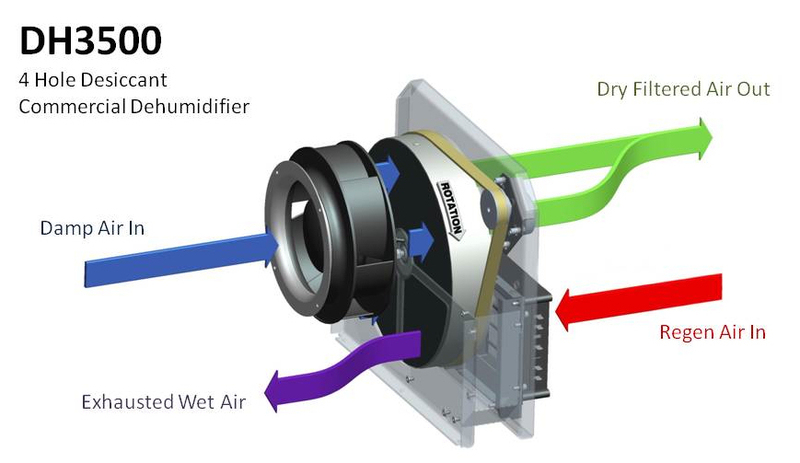 With a 4 hole system operating separate air flows means the heat energy is put into the room. This could be a disadvantage if heat is a concern. However, to get around this a little the following configurations will make the 4 hole version act more like a 3 hole with less heat gain.